Custom built on a corner lot with lake view! And that’s just the beginning of the quality features you will find in this home! Begin with the horseshoe front entry parking pad, through the double french doors into the completely open floorplan with a wall of windows overlooking the patio and fully fenced backyard! 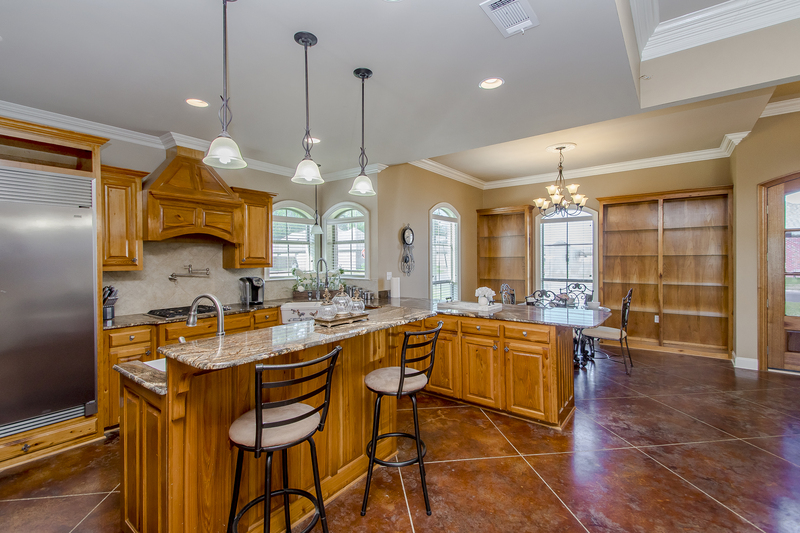 A unique custom touch is the varied ceiling heights defining the living area, kitchen and dining! Anchoring this living area is the large island and peninsula casual dining bar, massive commercial style stainless fridge, gas cooktop with pot filler, rich wood cabinetry (including one full wall of cabinets), slick granite countertops, coffee bar and a walk in pantry! An abundance of built-ins in the living room and one wall of them in the dining room. Scored concrete floors and crown molding throughout. With a split floorplan, 2 bedrooms, bath and laundry encompass the front wing, while the master suite overlooks the patio and backyard. Enjoy the spacious master and your en suite bath centered by the jetted tub. Double vanities, separate shower with multi shower heads and wrap around walk in closet complete this retreat! Enjoy the peace and quiet at the back of the neighborhood, too. Call or text 225.335.5395.